Violin set up and sound adjustment workshop. Andrea Ortona. BELE.Basque School of Violin Making. Plaza Ibarrekolanda 1, 48015 Bilbao. Spain. Timetable: Friday and Saturday 9:00-13:00/ 14:00-18:00 and Sunday 10:00-15:00. Selection of applicants will be based on the above required information. Accommodation:Bilbao has a wide lodging offer. However, we have made an agreement with “Colegio Mayor Miguel de Unamuno” hall of residence or students dorm (just in front of our school- see map-) to accommodate the participants in our workshops. All rooms are single or double and there will be a discount if a group of more than ten people ask for a place there. (Half Board: Room, breakfast + supper). Price per day. These prices are subject to changes. Please enquire. Andrea Ortona works closely with violinists to create instruments of exceptional power and musicality. He makes exact replica copies and new instruments. His passionate attention to acoustic and aesthetic detail produces violins, violas and cellos fit for the concert hall and more intimate performance spaces. Over the last thirty years he has worked in Cremona, Venice, America and England. His technique is a unique personal combination of the old Italian violin making tradition in which he trained, and modern acoustic research. He believes in listening with care and attention both to his clients and their chosen instruments. He trained at the Violin Making School of Cremona. He then set up a workshop in Venice and in the early nineties, he moved to England. In 1994, 1995 he worked with C. Hutchins on acoustic research in New Jersey and from 2001 for F. Leonard. He has been with J&A Beare since 2010. Between 2007 and 2012, he taught varnish retouch at the Violin Making School of Cremona and in 2012, he ran a course on “ relationship of the free plates and the acoustic properties of the finished instruments” . He has given lectures and run workshops in Italy, Austria and UK. 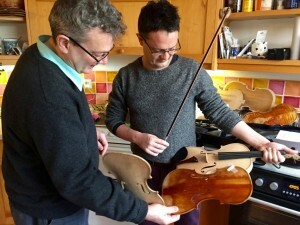 He divides his time between work as a restorer in London and making his own instruments in his workshop in Oxfordshire. First Find Your Tree. Andrea Ortona talks about his copy of a Guarneri Kemp violin with violinist Laurent Quenelle.